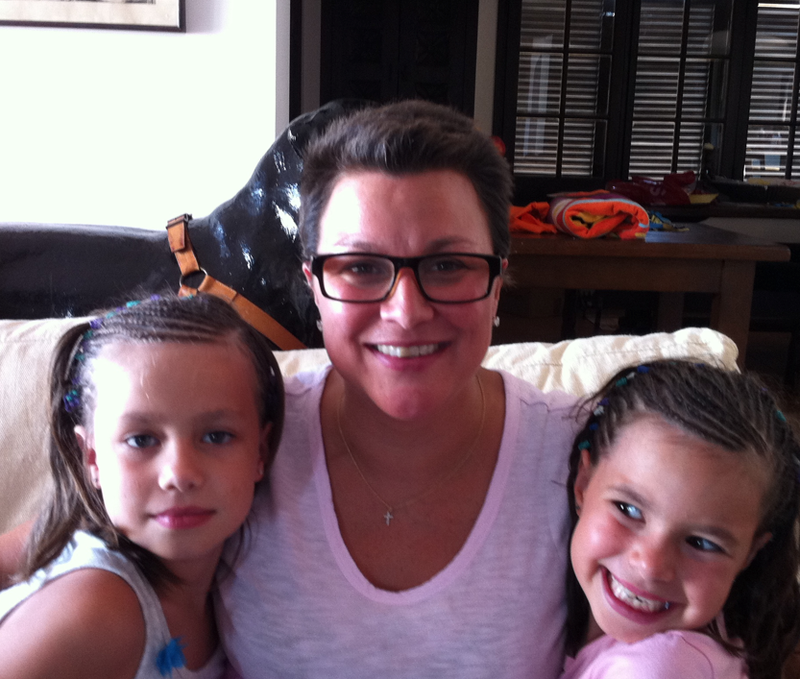 Shepherd, Carsen and Mummy with their new 'Do's"
As I woke up this morning and swung the large tree trunks still attached to me to the floor, I scooted across to the bathroom for my daily pharmaceutical snack. Amongst the variety of pills and pain buffers, the Letrozole, Fragmin, and Zolodex are really spiking this week and I feel more and more geriatric. So much so, when I walk, I have to so on my heels to get across the room! I stumble in the bathroom, brush my teeth, I turn on the faucet to start the process of slicking my new ‘Do’ down. “Urgh this hair! What am I going to do with it?” I pouted. Out of the corner of my eye, I soon realise Carsen, my middle child, has snuck in to watch the process. My hair is short, thick, dark and sticks straight up – no joke. Funny how the mirror looks back at you and just like that – SNAP – puts persepctive back in its place. I soon realised how small my ‘Do’ disaster was. “Good morning, Carsen!” I said as we walked out towards the kitchen. I kissed her and asked her then what the Chef was cooking for breakfast. 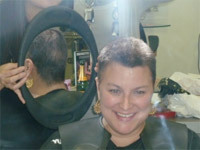 This entry was posted in ALL POSTS, Cancer, Chapters in Treatment, Laughter Is Best Medicine, MUST READS and tagged Balding Fashion Tips, Chemo Hair, Chemotherapy Beauty Tips, Chemotherapy Hair Styles, Help Bald Women. Bookmark the permalink. 5 Responses to Mummy, Why Did You Take Cancer Treatment? Hanapoop you all look gorgeous and personally I am glad you “took cancer treatment” if it meant saving your VERY precious life! I love you always!!! Perspective is right! While I think its fine to take a few minutes to whine, you’ve got those little bundles of pure light there to keep you on track. Thanks for keeping ME on track!! Thank you Julie!!!! It’s getting longer, now almost 2 inches!!!! So fast it grows! Again, you have me crying! First of all, your hair is awesome–wear it with pride as you are gorgeous!